The 134th annual Westminster Kennel Club Dog Show is underway with the Best In Show to be announced this evening. Last night we watched part of opening night on USA until the broadcast switched to CNBC just as my daughter was ready to watch the Toy Group. (CNBC unfortunately isn't part of our cable plan. Very frustrating!) The group results from last night indicate that the Whippet, Toy Poodle, French Bulldog and Puli placed 1st in their groups. We don't have a favorite at this point, but we are looking forward to watching closing night this evening. My daughter is also conducting her own stuffed animal version of Westminster and currently the St. Bernard looks like the sure winner. A few months back I had the chance to read an unusual and memorable middle grade fiction book by Berkeley Breathed titled Flawed Dogs: The Novel: The Shocking Raid on Westminster . Underneath the humorous and relatively offbeat cover is a story that both shocks and entertains, interweaving animal rights messages into a book with a patchwork of intriguing and comical canine and human characters. At the center of the story is Sam the Lion, a dashing dachshund destined to be famous, sporting the amazing "Duuglitz tuft" on his head. He escapes from his large and obnoxious owner into the loving hands of a Heidy, an orphan who recently reconnected with her uncle and is traveling home to live at the McCloud Heavenly Acres dog ranch. There Sam encounters Cassius, a conniving poodle that has Westminster dreams of his own. Cassius frames Sam, and Sam is thrown out of his home. Over the next few year, Sam endures a series of horrible and sad events, and eventually winds up at the Westminster Dog Show with his battalion of flawed dog friends. Berkeley Breathed intersperses several of his amazing illustrations throughout the story. This book strikes an interesting and powerful balance between tragedy and comedy. The evils of animal cruelty are all fleshed out in the book and at times the book seems like a ASPCA commercial. Sam loses a leg in a steel trap, gets transferred to a research lab, and ends up pitted against another dog in a professional dog fight. Not exactly the usual middle grade fare. 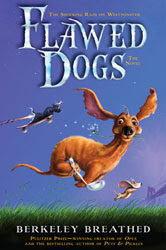 But the spunky characters, particularly the loveable "unloved" flawed dogs bring a comedic lightness into a dark world and shine with their resourceful actions. The Westminster scenes are hilarious and heartwarming. This isn't a book for sensitive children, and I wouldn't recommend it for those younger than 11. But for older tweens and teens, the book provides an engaging look into the world of animal welfare and humane education lessons and offers an often light-hearted, playful approach to a very serious topic and the plight of homeless dogs. When I was in high school I took an environmental awareness class and the instructor touched on animal cruelty. I clearly remember viewing pictures of rabbits that had been used for testing cosmetics. The story, Flawed Dogs, will remain in my memory in much the same way as those shocking images, but at least I'll be able to smile at parts. Dogs deserve loving homes and plenty of dogs, ones in need like the large-hearted Sam the Lion, are available for adoption at your local animal shelter.